President Trump has rotated between saying that a “major, major” conflict with North Korea is possible and that he “would be honored” to meet North Korean dictator Kim Jong-Un. On Sunday, North Korea did what it usually does when it’s unsure of what’s going on and tested another missile. The launch went pretty well. The last time North Korea tested a missile was on April 29th. The test was generally perceived to be a failure and the missile exploded several minutes after launch. Two weeks prior to that, a separate test ended with the missile exploding almost immediately after take off. It appears that the North Korean weapons program is figuring out its problems. 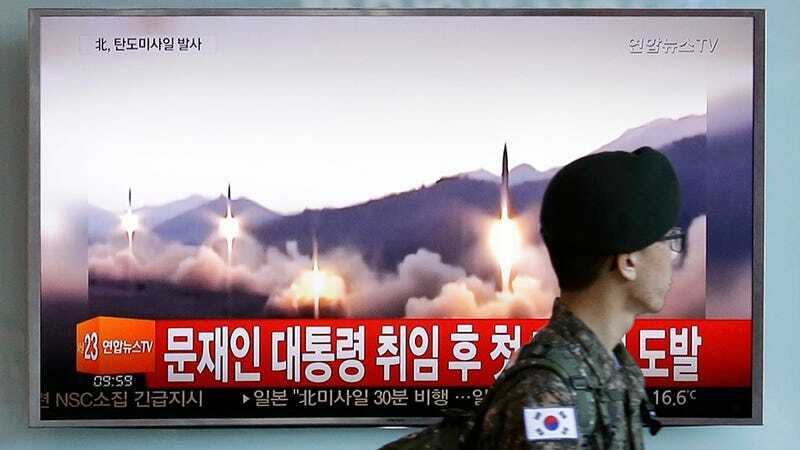 The test comes at a time when reports have indicated direct negotiations between the U.S. and North Korea are becoming more likely. The fact is, Russian President Vladimir Putin is currently in China attending the “One Belt One Road” forum in Beijing. The missile reportedly landed about 310 miles off of the Russian coast. So, there could be legitimate diplomatic motivation for attempting to put some focus on Russia. Maybe they could work some leverage with the Chinese, who are considered North Korea’s most important partner. Maybe they’re just as freaked out by these tests as America, South Korea, and Japan are. Nah, they were pretty chill about it. Russia’s Defense Ministry released a statement saying that the missile was not a danger because it flew a “significant distance” from their coast. Who knows why the White House decided to mention Russia three times in a short statement, but it certainly shows how much harm the administration’s handling of the Russia-Trump investigation is doing to its ability to govern. Even when Russia could legitimately be of help, many question Trump’s motivation for simply mentioning the name. Following Trump’s almost unprecedented decision to fire the director of the FBI and his subsequent admission that his motivation was basically to obstruct justice, he’s lost any good faith on the topic. Potential conflict with North Korea also comes at a time when White House insiders are privately suggesting that Trump is “in the grip of some kind of paranoid delusion.” And multiple reports indicate that he’s considering cleaning house and replacing most of his staff. With no one around to advise the commander-in-chief, things could really start moving fast.